This giveaway has a retail value of $48! Here's how to enter. 2) Get an extra entry for liking The Beauty of Life on Facebook and leaving a comment on the Facebook post about this giveaway telling me why you want to win this nail polish trio. This giveaway ends on Saturday, August 11 at midnight. One winner will be chosen AT RANDOM on Sunday, August 12. Maximum of THREE ENTRIES (one for each way listed above). Multiple entries will be disqualified. Giveaway is open to US residents only. I have never heard of RGB polosh. The colors are gorgeous thoug. Minty is another color I would adore, but Pink, Too Red, and Haze are beautiful, too. 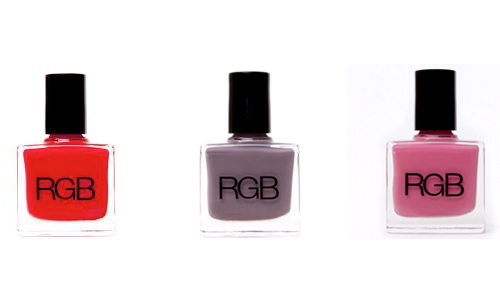 Do you find them to be long lasting polishes? As usual, so excting! I have not tried RGB but think I may have discovered it on your blog and have always wanted to try! I would love to try this brand. Thanks for the chance! Very pretty! I especially like the smoky violet one. Thanks for the giveaway, I love new nail polishes. Oh wow beautiful colors. They all would look amazing on me! LOVE RGB polishes. I have 2 now and would love to win this trio. I am dying to try this luxury brand! I love polish and have never had a name brand and would love for this collection to be my first ones! Thanks for including this in your month of giveaways! I never heard of RGB, would love to try them. These colors are sooo pretty!! Im loving the haze nail polish! Such a pretty color!! I have never heard of this brand would would loove to try them and am sure i would love them just like you! : ) thank you so much for the giveaway! I would love to win this. I never used RGB, but have been wanting to try it. I'm trying to expand my little collection and see what I really like. that red color is STUNNING! Those 3 colors are perfect. The I've been searching for the perfect bright pink for ages, and that red looks like my ideal candy apple shade. Thank you for this giveaway! Oh the red would make a great pedicure!!!! Ive never of these polishes before. What great colors! Hope I win, RGB! I love nail polish and love trying new ones! Oh my!! Each color is lovely and I want them all. I need to grow some more fingers and toes. Left a comment on your FB page under the contest posting! I'd totally love to win - great colors! Love nail polish.Would like to win.Thank you! Those colors are really awesome. Thanks!! You know I love nail polish.. I hope I win!!! Gorgeous shades! I've wanted to try RGB polishes for such a long time. Thank you, Jamie! Love to try these colors. I would love this! Been dying to try them but they are so expensive online and no one carries them near me. Would be perfect for the summer! I'd really like to try this brand of polish! Such pretty shades! Love their formula too! I would love to win this polish for my daughter. I would love to try RGB polishes. I hope I win :) Those are gorgeous shades. One of the best brands I've ever tried -- colors and staying power. never heard of this company but I love to try new things! I love nail polish! I would love to win this! I am so excited about your RGB Nail Polish Trio Giveaway. I would love to win. I discovered RGB this year and love it for it's beautiful colors, but even more so for it's beautiful ingredient policies! How awesome to be able to look good, but also do good things for your health. I would love to win this giveaway. I'm a Libra and I am really feeling the bright pink! I love the Smokey Violet and would love to try. Thanks for chance to win. Pink and purple - my girls' favorite colors! Guess that leaves red for me! never tried RGB polish. I hope I win! I've heard great things about this line and would love to try it! This is the first I've heard of this brand but I sure do love these colors!! This would be a great set of colors for fall!